Telecom operator BSNL has announced two new tariff plans for its prepaid users in Tamil Nadu. The two plans are Rs. 186 and Rs. 485, and under both the plans, BSNL is offering data and voice calling benefits. Read on to know what BSNL’s new plans offer. The Rs. 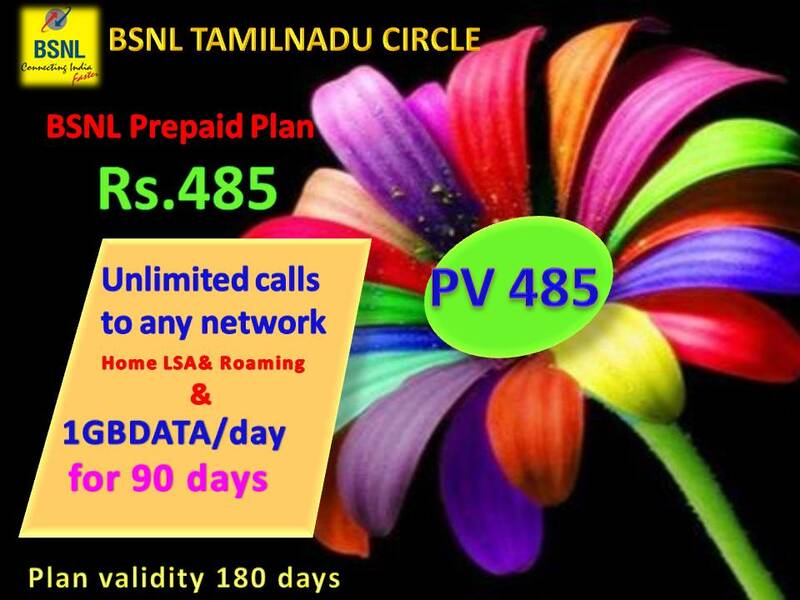 186 plan from BSNL is valid for both new and existing BSNL customers in Tamil Nadu state. In recent times, private operators such as Airtel, Vodafone, and Idea Cellular have launched affordable tariff plans such as Rs. 199, Rs. 195, and Rs. 178 offering unlimited voice calls and 1GB data. And the BSNL’s new Rs. 186 plan gives the same benefits of unlimited voice calls and 1GB data for 28 days. Sadly, the unlimited voice calling is applicable only in the home circle. So, the new high-data plan from BSNL for its Tamil Nadu users is the Rs. 485 plan. This plan is also valid for new and existing BSNL prepaid subscribers but offers extended benefits when compared to the Rs. 186 tariff plan. This plan offers 1GB of data per day and unlimited voice calls for 90 days. That said, the unlimited voice calling is applicable in both home and national roaming excluding Mumbai and Delhi where BSNL doesn’t have operations. Users can make unlimited voice calls without any limitation to any network across the country. As said earlier, these two plans are valid only for BSNL prepaid users in Tamil Nadu. And both the plans are launched on a promotional basis from October 21, 2017, to January 18, 2018. Also, users will get both the plans at cheaper rates if they activate it via SMS. For example, if you activate the Rs. 186 plan by sending an SMS as PLAN BSNL186 to 123, then you’ll be charged just Rs. 157 for the plan. Likewise, you need to send an as PLAN BSNL485 to 123 for the Rs. 485 tariff plan and the benefits will get activated on your number for just Rs. 411. As of now, there’s no info when BSNL is launching both these plans on a pan-India basis.